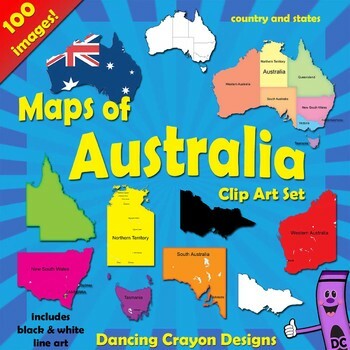 This clip art bundle contains maps of Australia along with map clip art of each of the individual Australian states. The above come in a variety of styles: states with and without labels. 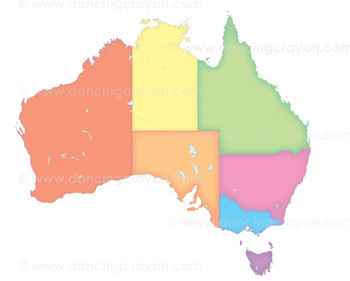 - Maps of individual Australian states - color, black and white line art, silhouettes, with capitals marked, with a few cities marked, or blank. The perfect map graphics for making teaching resources, worksheets, school projects, and more. Both color and black and white resources for all your different projects. All images are high quality PNG and JPEG files. Click here for 270 Flags of the World Clip Art Set! 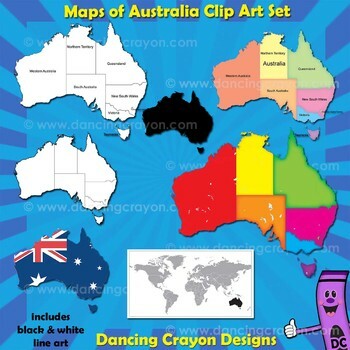 Click here to visit Dancing Crayon's 'Maps of the World' shop! 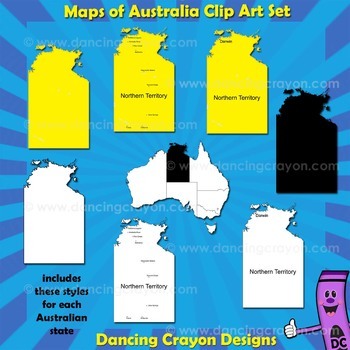 Tags: maps of Australia, Australian states maps, Western Australia, Northern Territory, New South Wales, Victoria, Tasmania, South Australia, Queensland, map graphics, map clipart, clipart of Australia, commercial use graphics, pictures of Australia, clip art.